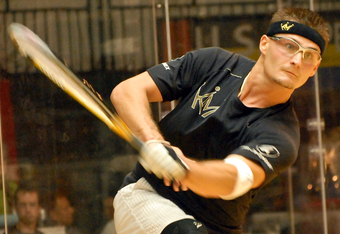 Congrats to Kane Waselenchuk on his win at the 41st annual International Racquetball Tour Lewis Drug Pro Am this past weekend in Sioux Falls SD. – this is his 114th career pro title, 43 more than the player in 2nd place (Cliff Swain). By way of comparison … Sudsy Monchik won 43 titles in his whole career … and now Kane leads the 2nd place tourney winner by that same amount. See http://rball.pro/B173E8 for more. – This extends his current match winning streak to 78 matches, 3rd longest ever. See http://rball.pro/8696B9 for more. – This extends his current GAME winning streak to 64, which is still a long ways from his amazing 113-game winning streak record, now that the tour has gone to best of 2. He’ll need to win the next 7 tourneys w/o dropping a game in order to challenge that record. Its also notable that Kane has yet to drop a game since the tour went to best-of-three scoring. In fact the closest someone has come in a game has been 12 points. Nobody’s gone any higher. The results of this event will result in a shake-up of the current rankings. Kane should ascend to #1. Landa will drop to #3, just barely ahead of DLR for now. Parrilla should rise from #8 to #5. Montoya will rise from #18 to #16 … but the next time he enters he should be on the opposite side of the draw from the #1 seed, making it easier for him to advance deeper. Meanwhile, in terms of Season-to-Date rankings, DLR sits just behind Carson in 3rd place, and would be easily in 2nd had he not missed the first event of the season. Given that DLR has 3 finals on the season and Rocky has just one … DLR is well positioned to ascend to the #2 ranking by the time the season is over. – North Carolinian and infrequent IRT player Brent Walters played the World Champ Rodrigo Montoya Solis tough, losing 7,13. Good showing by Mr. Walters. – USA Racquetball 18U national champ Ricardo Ricky Diaz played 18U World finalist Sebastian Fernandez tough, falling 12,12. – Charlie Pratt took out Andrew Gleason, who was making his pro debut. This is notable in that Gleason just competed in the 14U (!) division of Junior Worlds, losing in the finals. He still has at least four junior years underneath his belt and played well against a former IRT pro tournament winner in Pratt. – Biggest upset of the round may have been Sam Bredenbeck taking out #14 Thomas Carter in an 11-9 breaker. Big win for the younger brother of Jake. – Another upset was Iowan Brad Hansen, playing in his first pro event, taking out #22 Scott McClellan in a tough 11-8 breaker. – #10 Jansen Allen reportedly fell ill and withdrew from the event after the draw was published, giving local player John Goth a walkover into the 32s. This was the first time Allen has missed an event since the 2012-13 season, and it breaks a consecutive appearance streak of 64 matches, the 12th longest ever such streak in the pro tour history. – Gerardo Franco Gonzalez was stretched to a tiebreaker by long-time IRF veteran Alejandro Herrera Azcarate, eventually eking out an 11-9 win. – Montoya made quick work of Collins in the 16/17 match to setup the anticipated rematch against #1 Alex Landa on Friday. – #9 Mario Mercado was the unlucky tour vet forced to play former IRT pro Tony Anthony Carson in qualifying … and indeed he lost in two quick games. – Teenager Sebastian Fernandez got a career win, topping the veteran Charlie Pratt in a tiebreaker. In case you were wondering why we marvel at the continued success of Fernandez … he’s still got one year left of junior racquetball! He’s just now entering his age 18 season, having won Mexican 18U junior nationals over Eduardo Portillo Rendon but then losing in the Junior World finals to Portillo later in 2018. – Adam Manilla played a tough, close match against Mauro Daniel Rojas and advanced 11,14. – Sam Bredenbeck got his second “career best” win in a row, downing another IRT touring player in Nick Riffel 12,13. – John Goth got a solid win over Canadian Tim Landeryou 13,7 to advance and face Jose Diaz. We havn’t seen Goth on the IRT since 2013, and not in a pro event in more than a year, but he’s definitely a solid player and will be a tough out for Jose (who lost to him in the 2012 US Nationals). – Gerardo Franco got a solid win in the #15/#18 seed match over veteran Felipe Camacho to advance to another main draw. I often wonder about players like Franco, who get “stuck” right in that 15-18 Seed range on tour and thus constantly play right into the #1 and #2 seeds. He’ll likely need a stunning round of 16 win to get out of that range and start playing into “easier” opponents in the main draws. Qualifying summary: only three of the eight “seeded” players in qualifying advanced (#11, #13 and #16 seeds), but several of the upsets we saw by seeding were definitely not upsets by talent. We should see some great main draw matches. – Landa and Montoya went head to head and it was as close as it could be: 11-10 in the tiebreaker. Montoya came out on top this time, beating the #1 seed and defending champ in the 16s. This represents one of the earliest exits for a #1 seed in the last decade or so, thanks to unfortunate seeding. – Alvaro Beltran handled the upset-minded Tony Carson in 2. – Samuel Murray blitzed the 18yr old Fernandez 7,1, ending any shot at further upsets by the teen-ager. – Daniel De La Rosa played a closer-than-he may have liked match against Manilla, advancing 13,10. – Andree Parrilla got his first h2h win over Jake Bredenbeck by the odd-looking scores of 14,(14),0. – #7 Jose Diaz continued his strong season by advancing to the quarters over the tough amateur John Goth. – #2 Rocky Carson outlasted Gerardo Franco 10,4. Last event, I predicted Montoya would beat Landa at this stage, and the reverse happened. This time, I predicted a Landa win at this juncture … and the reverse happened. These two are so close; any given sunday either one can beat the other. – #16 Montoya downed country-man Beltran in two to advance to the semis. – #2 Carson took out #7 Diaz in two. o DLR then beat Montoya in the Worlds selection event final in June 0,8 (but I wonder about that score, since both qualified for Worlds by virtue of making that final). o DLR took out Montoya in the final of the Dec 2018 Mexican Open. So, it looks like DLR has Montoya’s number for now. We can only hope we continue to see Montoya in IRT draws. – Kane beat Rocky for the 74th time in 77 meetings to advance to the final. The final represented the third meeting between Kane and DLR for a tourney title this season, establishing a clear trend of some movement in the eventual season ending rankings. Unfortunately, all the momentum DLR gained in his excellent run to the final was for naught, as he came out very flat against the ever-consistent Kane and was wiped out in the final 4,2. This represented one of the most one-sided finals in the history of the pro tour, tied for the 2nd worst finals beating (in two or three game formats). In the doubles …. the top team in the world (Beltran & DLR) got upset in controversial fashion in the semis, losing to eventual winners Montoya/Parrilla 11-10 in a match ended with an avoidable hinder call. They beat #2 seeded Landa/Murray in a close final 11,11 to take the crown. Another excellent Lewis Drug event in the books! Next up for the IRT is a popular Tier 2 in Wisconsin in two weeks time, but we don’t have another Tier1 scheduled for two months. No surprise who #1 is. The intrigue starts a bit later. International Racquetball Tour regularly, the IRT rankings do not really give a full picture of the current state of the world game. This attempts to do so. I have rankings divided into “groups” so this isn’t a hard and fast 1-50 necessarily, as I’ll explain as we go. Usual caveats: this is my opinion. No offense intended if you think someone is too high or too low. This is for entertainment purposes only. Its mostly stat/match result based. Its tough to do pure 1-50 b/c of game style match-ups (i.e., a guy in the 30s always beats a guy in the 20s for some reason, but can’t beat anyone in-between). Also, one big win over a top 10 player does not make you a top 10 player … i’ve noted solid wins for players below the top of this list, but look for consistent results over and again before rising up the ranks. Large Gap to #2: Kane is head and shoulders ahead of anyone else. Smaller Gap to #3-6; Rocky still has a lead over the next group and continues to demonstrate it on the court. I have these guys 3-6, and they’re constantly changing positions. Up until the Mexico Open I had Landa above Montoya, but then Montoya got him H2H. Honestly, I think they’re a coin flip for #3 and #4 right now. Meanwhile, DLR is 3-6 H2H against Landa across senior events so i’ve got him just below Landa … just beat Parrilla and Montoya to win in Monterrey, but lost to Montoya at Mexican Nats earlier this year. Parrilla beat Landa at the past US Open but for me day in, day out is slightly below these other three. On any given Sunday though, these four can all put losses on each other. It is not a surprise that these four were then fou semi-finalists in Monterrey earlier this month. Moscoso has wins over the guys ranked 3-6, but just lost to Montoya at Worlds and lost to Murray at US Open. I know some people think he should be higher (ahem, Sudsy 🙂 ) but i’ve got him just a hair below. Mar is an enigma; he’s demonstrated the ability to beat all the guys ranked 3-6 and has in the last couple of years, but not quite consistently enough to break into that group. Murray has wins over Montoya, Landa and Moscoso in the last few events; he’s becoming much more consistent winner as of late. Lastly you have Alvaro, who has been showing his age but then turns around and trounces the likes of DLR in Portland. He’s still a tough out, week in and week out but has been consistently slipping down this ranking over the past couple of years. And the one American player is nearly 40. The next generation of dominance in our sport is coming from south of the US border. I call this group the “retired but could still make noise if they weren’t” group. Jose retired after three straight finishes at #5 on tour, and he didn’t retire because he was losing suddenly. Mejia hasn’t played in a while, enough that we may want to remove him, but when we last saw him playing WRT events he was beating consistently those ranked just behind him in the next grouping. Marco Rojas retired after two 7th place finishes on tour, and has winning career records against DLR and Landa, and against guys in the next grouping (Horn, Jake), so its no surprise he’s still this high. Lastly Tony Carson consistently demonstrates he can continue to win, with wins over DLR and Parrilla in the last two IRT events he’s entered. Here’s where it starts getting tough. This group here is a mix of international players we rarely see, leading World Racquetball Tour players, and mid-ranged IRT players. You may argue that I have Polo too high; but every time he plays an IRT event he makes noise. He’s coming off an elbow injury and is 35 though, so he may be slipping. Horn has some wins against higher ranked players and won 2018 US Nationals in a draw that included Jake, Pratt and Jose Rojas. Pratt has some h2h wins over players in this group, over Beltran, and beat Mar en route to the 2017 Pan Am final. Franco has recent wins over Landa and DLR, and has a solid argument to be higher. Mercado too; he’s 2-2 vs Murray career but just 1-5 against Horn and this feels about right. Iwaasa took several years off, but has not lost his touch, taking Mercado to the edge at Worlds twice and making the Finals in the WRT Canada event in a draw that featured several guys in this group. Keller Vargas won the 2018 Pan Ams over Montoya and Horn, but lost to Franco at Worlds; I used to have him much higher and wonder if he’d be a top 10 player if he played the tour regularly. Lastly Jake; he’s one of the few players to have wins over Kane, DLR and Rocky ever, but has struggled to beat players in this group or the grouping above lately and has been slightly slipping down in this ranking after having some early IRT season struggles. Croft is pretty much retired, so not much recent to go on; he beat Horn but lost to Jake in a singles event in Denver earlier this year. Estrada, Natera and Ochoa are all rising Mexican players to watch out for. Estrada beat Landa at Mexican world selection event, just beat Beltran in Monterrey and has played Montoya tough twice this fall. Natera has recent wins over Mar and others in this grouping. Ochoa has recent wins over Beltran, Parrilla, and Mar and may very well be higher. Cardona used to be in the next group up as the reigning king of the hill in the WRT but has been losing ground to the likes of Horn and Jake and the youngsters rising up in Mexico over the past year or so. Sudsy made the semis of the US Open last year by beating Allen, then beat Diaz but lost to Jake in an WRT event so this seems about right (thought I wouldn’t argue if you thought he was higher). Allen has had some solid wins against the likes of Beltran, Mercado, Murray lately, and beat Diaz in the Laurel season opener, and may be a bit higher. Lastly you have the younger Rojas, who has consistently beaten players below here but not too many above and who has the game to start breaking through and moving up. This grouping could benefit from more head to head meetings; would Allen beat the likes of Estrada, Natera and Ochoa if they played? Here’s hoping for some more IRT events held in Mexico to get more full draws. 32. Cliff Swain; even though he hasn’t played in more than a year, I still think he could beat anyone listed below here. I’m hoping he plays some more pro events and tries to break some of Ruben Gonzalez‘s more amazing feats of reaching the end stages of pro tourneys at advanced ages. As with the group above, its tougher in this area to really rank guys sequentially because there’s not a lot of h2h to go on. Gerardo Franco probably has an argument to be higher, with recent wins over Sebastian Franco, over DLR and Jake in Cincy18, etc. I’ve got Lalo just ahead of Sebastian on account of his h2h win at Junior Worlds, but Lalo has lost multiple times to Gerardo Franco in the last year so this trio feels right. Martell has great wins (Landa, Jake, Horn), but then also has early tourney losses in recent WRT and amateur events. Garay has wins over guys in this grouping and against the likes of Parrilla and might be higher. Alonso plays the guys in this grouping tough, has wins over Parrilla in the past but needs more consistency. Landeryou has h2h wins over both the next two guys below him hence the ranking, but not much else to go on. Reid has a win over Mercado and a US Open title in Men’s open in a draw that featured many players in this group or just below, so this ranking makes sense. 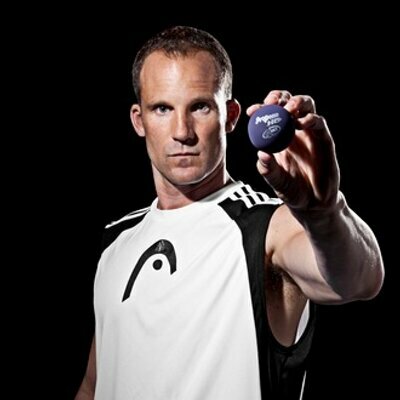 Green has reigned over Canada racquetball for two decades but may be retiring and most recently lost to Landeryou at Canadian Nationals. Longoria has some wins over the likes of GFranco and Estrada and may have a case to be a bit higher. Lastly Manilla just took out Mercado in Laurel18 and has had a promising start to the new season, so this seems about right. Herrera is a long-time IRT vet, just took the 2018 US Open Men’s Open draw over Acuna in the final and beating several Honorable Mention players along the way. Acuna has some solid wins recently (Portillo, Camacho, even Horn at the US Open) and may have a good argument to be higher. Rios doesn’t have much to go on recently but has good wins internationally in the past. Garcia is the 16U reigning world champ who has beaten a few of the HM players in limited adult tourneys. Mollet is the Cuban #1 who makes noise whenever he enters (beat Camacho h2h at Central American games in 2018 for example). Camacho has some wins over higher players (Fernandez, Allen) but has losses to players right in this group so this feels about right. Bousquet had some solid wins over HM players in 2017. And it should be noted, there’s a slew of HM players below who might very well be in this group, or slightly higher. In fact, as I typed this I wondered if any number of the below players shouldn’t be in this 40-50 range. Phew. Hopefully I didn’t miss anyone; let me know in the comments if you think I did. Look forward to your commentary. Happy Holidays!